SOME OF THE FINEST AKOYA PEARLS IN THE WORLD ARE INDIGENOUS TO THE PRISTINE WATERS AROUND BROKEN BAY AND WOY WOY. Story by Catharine Retter, Coast Magazine. There, that caught you by surprise. Why didn’t we all know about this? What makes them so special, and why the waters of the Central Coast? 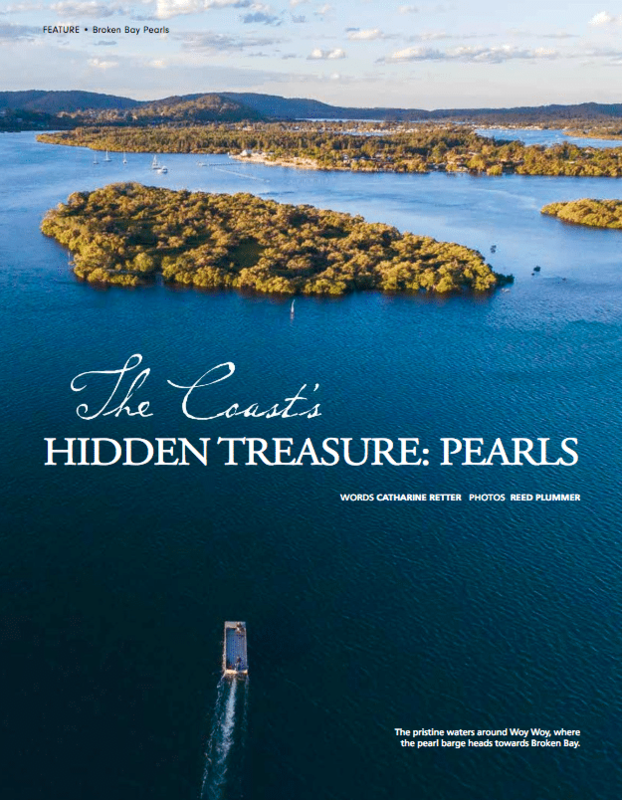 James Brown, a marine biologist, and CEO of Broken Bay Pearls, has flown from Broome where three generations of his family have run Cygnet Bay Pearls, farming the sought-after Australian South Sea Pearls. I couldn’t wait to ply him with questions about the little-known Broken Bay pearling farm that he has just bought into. The answer about what makes the Broken Bay Pearls so unique and so special is both complex and deceptively simple… once you know. The pearls in question are Australian Akoya Pearls grown deep inside creamy brown-grey Akoya oysters firmly bedded within their luminescent mother-of-pearl shells. Akoya pearls have long been famous in Japan, Vietnam and China. But it seems they’re still largely undiscovered here, even though they’ve been formally identified by pearlers, marine scientists and the Australia Museum for up to 100 years. These wild pearl oysters were also thought to be important as food to the Awaba Darkinjung peoples around Broken Bay more than 200 years ago. The Akoya’s flesh looks more like a mussel than a Sydney Rock Oyster and I’m told they taste like a cross between a scallop, a mussel and, well, a rock oyster. Dr Wayne O’Connor is an internationally acclaimed Senior Principal Research Scientist in molluscs whose work has done much to help establish pearl farming on Australia’s east coast. He agrees the quality of Australian Akoya pearls is unsurpassed. The pearls’ natural colour range is also spectacular: from traditional pure white, to a subtle pink-hued white, to silver-pink, even gold, as well as a rainbow of shades in between. The colours come from the dominant colour in the donor mother-of-pearl grafted tissue inserted into the host oysters that allow the pearl sacs to grow. Ian and Rose Crisp are two of the founding partners of Broken Bay Pearls. When they were oyster farming in the 1990’s they came across young wild oysters among their crop that definitely weren’t Sydney Rock Oysters. NSW Fisheries identified them as Australian Akoya Pearl Oysters, so the two then began growing stock for a Japanese company before establishing Broken Bay Pearls. ‘To avoid in-breeding the oysters, we source new breeders from wild stock,’ says Rose. After having bred oysters since the 1990’s Rose and Ian know where the best wild stock is found up and down the coast. Ian is the pearl farmer who reads the tides and the water quality like an inland farmer reads the soil and the seasons of the land. Rose is an unusually skilled pearl technician by both Australian and world standards. That she is one of only a small number of women in this role makes her even more special. At first meeting you sense her down-to-earth nature and an unmistakable pioneering spirit, but to watch her is to observe a micro-surgeon at work. There is little if any talking and background noise is muted as Rose prises open a shell, only wide enough to insert a round-bladed scalpel and hooked probe. Then she makes a small incision deep in the mollusc’s gonad (which, to the untrained eye, looks like any other part of the oyster). Here the oyster is ‘germinated’ with graft tissue and one or even two small round shell nuclei are inserted by means of a tiny cupped probe. The nascent pearl is left to grow for 18 months into a beautifully round shape 4 to 8mm in size, although baroque pearls are also found. Before producing their pearls, it will have taken around two years for the oysters to grow from larvae into juveniles, called spat – that look like tiny, scruffy grey shells you wouldn’t give a second glance to – and then into oysters that are big enough to thrive in open waters. After that, Mother Nature plays a major part in the success of these Central Coast pearls. The oysters are grown fully submerged on long lines not easily found or accessible to anglers or would-be oyster thieves in the many miles of waterways. So skilled is Rose and her team in seeding the oysters that, this year, Broken Bay Pearls harvested up to 5,000 single and double-seeded oysters, most of which resulted in AA and AAA grade quality pearls, the highest standard attainable. The abundance of National Parks and natural bushlands that surround these waterways anchor the soil, preventing it from flowing into the estuaries. The familiar mangroves and the prolific seagrass beds – regarded as the ‘forests of the sea’ – act as lungs for the waterways, producing oxygen and trapping any fine sediment. And, because Akoya pearls are saltwater pearls, the salinity level of the water is all important, so the free flow of the tides and the lack of rivers flooded with industrial run-offs is crucial. If this sounds like organic farming, you’d be right, and a pearl oyster needs to thrive, not merely survive, to be able to make its coveted lustrous pearl. And yet, such is the embedded nature of the pearl market around the world, that the prices gained by Australia’s fledgling Akoya pearl industry have not yet caught up to their true value. But be forewarned, there’s a slow, perhaps grudging, recognition emerging and a sense in the air that the tide is about to change.